You may have heard someone on the Mimi team describe our “verification process,” or you may be just about ready to send your very first Mad Mimi mailing. We have a super-quick verification step in place, just so we can be absolutely sure that you’ll see smooth sailing and safe sending! This just means that your account is in pre-verification status. To kick off the verification process, enter the URL for what you would consider to be your primary web presence—whether that’s a website or one of your social media pages, that’ll do the trick! If you don’t have a primary web presence established quite yet, no worries. Just check the box for that option in the popup window and click the orange Submit button. From here, the folks on our support team need to take a quick look over your promotion before we can send it out, which is our way of ensuring you’ll be off to the races in a way that’s safe and effective for your long-term inbox delivery. So, no—your emails have not been sent yet. But don’t worry! Your verification process has already begun behind the scenes, and you’re on your way. There are a few reasons that it’s important for us to give your mailing a quick once-over before you send for the first time. And all of them are for your benefit! Because Mad Mimi is a permission-based sender, we do need to make sure that all your audience members have opted in to receive your emails. We also need to be sure that your list is current, so you can avoid damaging bounces and potential spam traps. Additionally, we want to make sure you haven’t inadvertently included anything in your mailing that might get it blocked or sent to junk folders by spam filters on the receiving end. Some examples of the spam triggers we look for include link shorteners, URLs typed directly into your body text, and other things that we’ve learned have a tendency to look suspicious in the eyes of spam filters. Finally, we’re checking to make sure everything looks good! We know you want to make a great impression on your audience, and we want to help you do that :) We’ll check to see if your links are actually clickable and if you’ve included a banner image. We’ll also double-check that all your images look crisp. And if anything seems out of sorts, we’ll let you know—before your emails go out! The bottom line is, we want to make sure you enjoy all the success you deserve from your email marketing efforts. The verification process is our initial best foot forward in helping you do that. What do I need to do after I’ve filled out the verification popup? Now, you may have sent your email using a different “From” address, and that’s OK! Just know that all account communications, including verification follow-up emails sent by our inbox support team, are always going to be sent to whichever email address you use to log into Mimi. After a short time, you should see an email come through from one of our lovely Mimi support folks. This email will ask you for some details about how you gathered your subscribers. We need to understand your process in order to make sure we’re doing absolutely everything possible to get you sending safely and smoothly. We’ll also take a look at your links, your images, your layout, your subject line, etc. to make sure it all looks ready to go! We’re just double-checking that you don’t have anything that could cause your email to get caught up in spam filters or blocked from normal delivery. 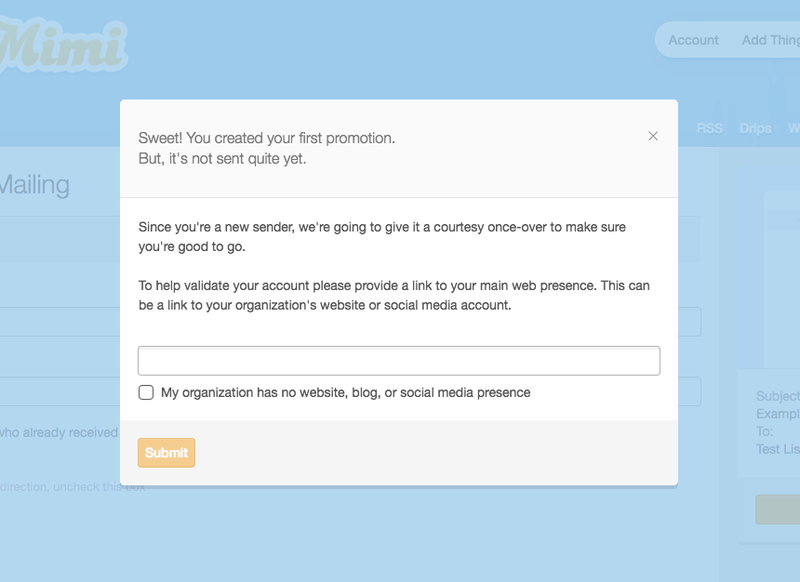 If we see anything potentially problematic in your promotion, we’ll let you know via email. Then, just reply to us! We need to hear back from you with those details, along with answers to any other questions we’ve asked, so we can be sure to get you sending safely & effectively as quickly as we can. During the verification process—after you’ve filled out the popup window, while you’re trading emails with our support team, and so on—your Mimi mailings will not be sent. As soon as we verify your account, your most recent send attempt will begin delivering automatically (unless you request otherwise). If you pre-scheduled a mailing for a later date & time, that schedule will simply remain intact, and your emails will be sent when that rolls around. What if I scheduled my email to send out later? Will it go as soon as I’m verified? The short answer here is that scheduled mailings will send when they are scheduled. But because nothing will send while you’re still in the verification process, that makes scheduled mailings sort of a special case. It’s important to recognize that if the scheduled time for the mailing comes & goes and your account has not yet been verified, then the mailing won’t send. Even if your account is verified later on, because the pre-scheduled delivery slot for that mailing has already passed, the mailing was missed. It will either need to be manually resent in real time or pre-scheduled again. However, as long as the scheduled time for the mailing is still in the future when your account is verified, your emails will be sent without any hiccups in accordance with the schedule you’ve put in place. If you have any questions about your specific account status, just shoot an email to support@madmimi.com and ask! If you’ve pre-scheduled your mailing and gone through the verification process, but are still unsure about what’s going to happen, just let us know. We’re happy to take a look and help make sure that your emails go out exactly when you need them to, and that you’re fully informed the whole way through. What if I don’t see any verification-related correspondence in my inbox? Why can’t I get verified over the phone or via live chat? It’s totally understandable that sometimes, things are just easier to explain in a different medium than email. Here at Mimi, though, we do need to keep all verification-related correspondence between you and our inbox support team (at support@madmimi.com). The big reason we need to handle all Mad Mimi account verifications exclusively via email is that by doing so, we’re complying with an essential industry-wide anti-spam requirement. Simply put, by keeping things in written form, we have a tangible record of your contact-gathering process. That reinforces the high level of trust we maintain with ISPs and blacklists—a level of trust we’re then able to share with you and all users of Mad Mimi in order to get your emails where they belong: directly in your contacts’ inboxes, and not in spam folders. Of course, as always, reach out to us any time with any questions or concerns you might have. We’re here for you, and we’re standing by to help you get the most out of your email marketing efforts!